With the rather unattractive common name of ‘Lungwort’, Pulmonaria plants and species are widely grown for both the foliage and the tubular flowers. The common name will depend a little on the species and where you come from. However these early flowering plants do have a lot to offer the gardener. Colorful flowers, attractive foliage and they grow in shaded ares. Not great is very dry conditions, however with a little moisture through summer and some shade they make a great garden plant. Pulmonaria officinalis is an perennial evergreen species. 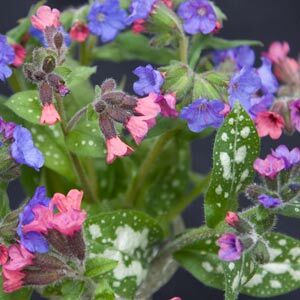 Pulmonaria saccharata is also known as Bethlehem sage and has white spotted green foliage. Pulmonaria Sissinghurst White is one of the best known. Pulmonaria Blue Ensign is a lovely cultivar reaching around 30cm. Pulmonaria Glacier has white flowers as you might expect from the name. P. augustifolia ‘Azurea’ is a very useful species for damp conditions. A humus rich moist soil is best and protection from hot afternoon sun is essential. Try planting with Hostas as they like similar conditions. All species grow well in shade and are really an easy care plant. As they form clumps they can be divided every 5 years, they can also be propagated from seed. Plants can be given a quick tidy up by pruning back spent flower heads in summer.